Despite the drop in the number of illegals, the crime rate of those in the country has shot up, a secret report by Tel Aviv police said. With the construction of the security fence in southern Israel and the increased vigilance of the army on the Sinai border, the number of illegal African refugees has fallen sharply. In September, only 168 illegal Africans entered the country, compared to about 2,000 in January, officials said. Despite the drop in the number of illegals, the crime rate of those in the country has shot up, a secret report by the Tel Aviv police department said. A report in Ha'aretz quoting the report said that 2012 saw a sharp increase in violent crimes among illegals. 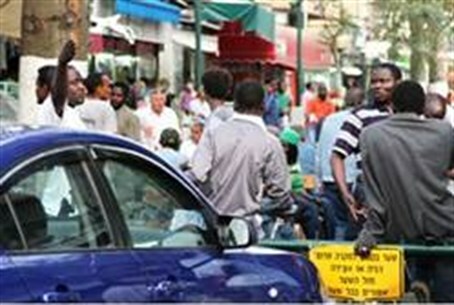 According to the police report, 882 illegal Africans were questioned by Tel Aviv police so far in 2012, compared to 610 in all of 2011 – an increase of 45%. Eight hundred ten files were opened against illegal Africans in the past ten months, compared to 645 in all of 2011 – an annual increase of 55%. Of the files opened, 497 involved property crimes, 199 involved physical attacks, and 70 involved moral offenses. The report added that Israel's policy of deporting illegals could actually be working to increase crime. Police said that illegals from certain areas, such as Darfour, preferred to spend up to three years in Israeli prisons rather than be deported to their homelands.